Named after the sound a box of Marshmallows makes when it is posted through the letterbox, Boomf is a gift card company, and the name is not as random as it sounds. Boomf specialise in Personalised Marshmallows. 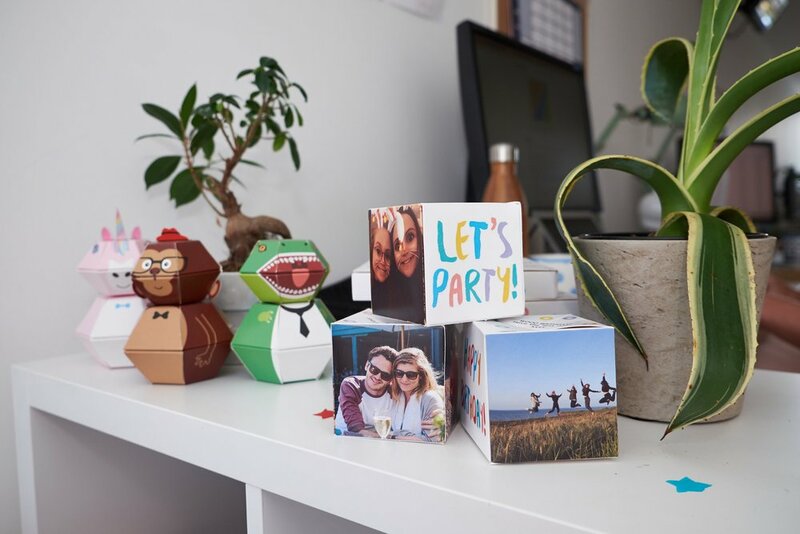 Since its launch in 2013, Boomf has expanded its range of zany gifts, from exploding confetti cards to pop-up unicorn creations. The letterbox friendly gifts are handmade in their factory in Reading and can be shipped Worldwide. Head of marketing Hannah Kennedy has worked at the company for nearly two years. In the Boomf office on the third floor, she talks through the company’s various products, including the flutter card, which releases a flying butterfly when opened, and the customisable exploding “Boomf bomb”. Hannah believes that the office’s quirky shipping container setting fits with the firm’s ethos. “Before we moved here, we were working at a shared office space in Farringdon, which didn’t really encourage creativity,” she explains. Hannah says the decision to move to Containerville was purely practical. “We were challenged by the board to find a cheaper alternative to office space in Farringdon and, as many of us live in east London, it made sense to move to Hackney. Hannah also talks about the sense of community. “The other evening we had a community Containerville ‘villains’ BBQ. There was free food and an opportunity for each business to present what they do and hear about everyone else. I can definitely see there being opportunities for us to work with the other businesses here and help each other out in the future. We also really enjoy canal life generally. Hannah says the many independent coffee shops in the area is another plus: Flying Horse Coffee at Mare Market Street or the candy-coloured, Instagram-famous Palm Vaults are recommended spots.